Bio-manufacturing instruments and techniques have become influential in everything from generating high yield pharmaceutical precursors, to biofuel conversion from biomass. Bioprocessing, or the mass production of therapeutic products, includes three production phases: upstream, fermentation, and downstream processing, each providing an opportunity for improvement in efficiency. Last October, at the biannual Bioprocess International Conference & Exhibition (BPI), exhibitors had focused their efforts on three ongoing trends affecting the industry: the emergence of continuous processing, the move towards single-use technologies and the focus on improved process productivity. Single use technologies (e.g., disposable bioreactors made of plastic), are beneficial in contamination prevention and by extension reducing cleaning costs. As you dispose of a reactor after each use — it eliminates any chance of cross-contamination thereby vastly reducing the time and effort required to test for and identify contaminated batches. Normally, bioreactors and their accessories need to go through an autoclaving process both before and after fermentation to prevent contamination and allow for disposal of used products. This process is lengthy and consumes high volumes of water; with single-use instruments, manufacturers can be cost-efficient while conserving water. Unfortunately, the largest drawback with single-unit products is a significant drop in efficiency between upstream and downstream processes, which brings us to the effort of improving continuous processing. Here, we reflect on some of the advancements within the last year that have tried to achieve some of these goals as well as highlight notable collaborations and events. Our analysts have been working hard to see how these trends have impacted the bioprocessing market and are gathering data for our 2018 Bioprocessing Market Analysis and Perspectives report. As they started compiling the information, they noted several significant obstacles still exist to implement commercial continuous processing, including the conservative nature of the pharmaceutical industry, and the development of other enabling devices that allow for real-time monitoring and control of the process. column system architecture, enabling a highly flexible flow configuration for continuous processing. At-line or in-line sensors used to monitor the process were also showcased at BPI. 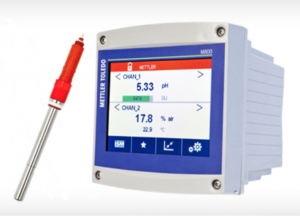 Mettler-Toledo, demonstrated an in-line liquid phase dCO2sensor, the InPro 5000i, capable of real-time measurements critical for enabling continuous upstream processing. Sartorius Stedim Biotech’s BIOSTAT STR bioreactor product line allows for more rapid direct linear scale-up of fermentation processes. In March 2018, MilliporeSigma signed a memorandum of understanding with Schneider Electricthat aims to automate biopharmaceutical processes for China’s biopharmaceutical industry. 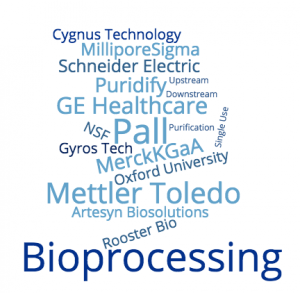 Last November, GE Healthcare Life Sciences’ BioProcess business acquired Puridify. Puridify’s FibroSelect nano-scale single-use purification technology is designed to improve process development and small-scale manufacturing, with faster mass transfer, scalability and ease of use. In January 2018, Pall announced a newly named business unit, Pall Biotech, within Pall Life Sciences. Pall Biotech’s portfolio consists of standard configurable single-use, stainless steel and hybrid technologies for fed-batch and continuous processes across upstream, downstream, and formulation and filling applications. Pall’s collaboration with Artesyn Biosolutions announced in April 2018, a co-development project for complete solutions from clinical to commercial scale for single-use automated bioprocessing systems. In April, Merck KGaApartnered with Oxford University’s Jenner Institute to develop more robust and scalable vaccine manufacturing processes. The partners will improve the manufacturing process for adenovirus vaccines using Merck products, systems and technologies on a real-­world feed stream. In June 2018 we saw Schneider Electricrelease its new FXI Series 7 Process GC. It enables multiple detectors and ovens to be utilized simultaneously to decrease analysis time. RoosterBiojoined the new NSF Engineering Research Center for Cell Manufacturing Technologies (CMaT), which aims to enable scalable manufacturing and broad use of potentially curative therapies that utilize living cells as drugs. 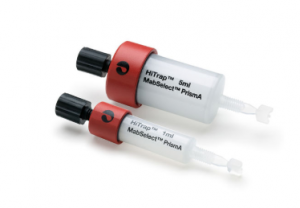 In August, Gyros Protein Technologiesintroduced the Gyrolab CHO-HCP E3G Kit for impurity analysis in the CMC (chemistry manufacturing and controls) bioprocess workflow of biotherapeutics. The kits were developed as part of its licensing and supply agreement with Cygnus Technologies, using Cygnus’ 3G CHO-HCP ELISA reagents. Stay tuned for our next articles in the series, which will provide some insights from the 2018 Bioprocessing Market Analysis and Perspectives report. This report will cover components within the upstream and downstream processes and include end-user perspectives.